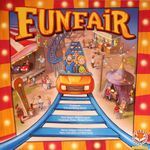 A geeklist consisting of titles that are based around the theme of building/running an amusement park. Sadly under-utilised, IMHO, and thought it might be fun to build a discussion around the potential of the premise. The titles included all possess very different gameplay mechanics, providing a nice level of variety. 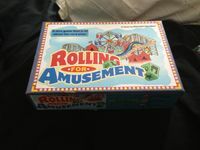 A nice combination of mechanics, including randomly rolled actions, dexterity (physically grabbing turn order tokens), randomly drawn customers, and careful planning/ride placement make this a truly unique title - a good game all round, even if player interaction is kept to a minimum. The fantastic artwork is just the cherry on top of a sweet little game, suitable for everyone (and introducing the hobby to non-gamers, in my experience). An expansion is forthcoming, which I am very excited to hear more about. Wow, this looks interesting. Card game, allowing a player to construct up to five rides, each customisable through themes and extra features, to provide the player special abilities and options to directly target an opponent. What an excellent concept (sadly rather similar in many respects to a game of my own design... but hey, if it means a good game is out there! ), and featuring amazing artwork judging from the previews. One to certainly keep an eye on - hopefully hitting a Kickstarter campaign later this year. Reads like it will be an interesting take on balancing categories within a limited space *and* taking a 3D environment into consideration (as scoring varies based on visible attractions from a number of angles). 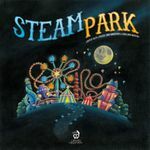 An innovative take, and something I had hoped would feature in SteamPark. Fingers crossed the rules will be released soon, as this could be a fantastic title. Rather simple, but mechanically very effective, game of building rides to attract certain types of customers, each with a specific taste or consideration. I really like the notion of having a general and local (specifically laid between every pair of players) to encourage a greater level of competition. Great artwork by Arron Williams (of Nodwick fame). I would have perhaps liked to see a little more variety in the amount of rides available, but that's just a wee cosmetic complaint. A hard to find gem, this title is well worth tracking down and contains a lot of elements. It is wonderful to see the board/park develop and fill with attractions and stalls as the game progresses, even if their placement is strictly set. An advanced Monopoly-style of gameplay. Such a shame that this title never saw a wider-release. Build a theme park and manage the needs by way of laying cards, I'm not a huge fan of every card having 4 exits (making anything playable anywhere) and think it could have benefitted from having a variety of limiting placement factors for the more valuable cards. The game could have seen a big-box release with components for ease of tracking scores and park needs, as it is a lot of fun. Certainly worth trying to track down a copy. "A good theme park tycoon knows that his or her best chances of becoming a legend in the industry, not to mention extremely wealthy, is to build a park that is not only profitable, but one that keeps its Parkies happy! In Parkies, you'll strive to do exactly that. You'll compete with 1 to 4 other players to build the best theme park possible, while attempting to attract the Parkies. 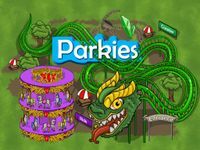 Parkies are the absolute power in the game, so good Parkie management is as important as your ability to design a clever and efficient park." Alas, not quite as involved as I had hoped, especially given that the action takes place around building a single park between all the players. The amount of rides (grand attractions) available really is miniscule - reducing the variety (and replayability) to virtually nil. Some interesting ideas regarding bribery are worked into the mix, but I think these will be implemented in a far better fashion within Unfair (featured later in the list). On the whole, not a failure, but neither is it a very interesting title. 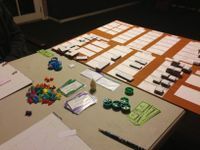 A small-scale cardgame, where players manage resources provided by specialist employees in order to claim certain attractions and build them up into grand spectacles, all in order to impress the press. I had high hopes for this one, which were unfortuately not met in the slightest. The rides are banal, with an equal focus on entertainment shows and eateries which seem to overshadow the rides, and ultimately feels like a smalltown carnival rather than full theme-park. Some nice mechanical ideas, but not enough to sustain interest for more than a single game. A push-your-luck dice rolling game, where attraction cards have multiple uses to either help yourself or hinder opponents. Forthcoming. A worker placement title, which could work very well with the theme of being rival park planners within a single company, but unfortunately very little else has been revealed. One to watch. Forthcoming. 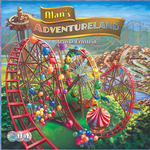 Another game that has been long in development, but looks like it may well be the closest a boardgame can be to capturing the spirit of the old Theme Park videogames. Tile placement and actual custom rollercoasters! Very excited to see anything more of this project - and hope to send some support the designer's way with this list. If the different rides/stalls can feature a mechanic of attracting different customers, a la Scream Machine... this could be an ace little title. Set collection with a theme park attraction theme. Not a bad game, but I did not like that as the game progresses your play options reduce. This one took a lot of consideration to add, but ultimately I feel it fits the theme (somewhat), building rides to attract certain types of client, used to defend your park against attack by beasties. An unusual take on the theme, but... an experience I certainly enjoyed! The diversity of customer groups, standalone adventurers, and monsters, coupled with the random selection of available staff for each game, do provide a lot of replayability. That said, it is a little fiddly for those who have not played before, and there are perhaps a few too many monster cards, which are far too punishing for those in the lead when drawn. Were they toned down a touch... I would have no issue in heartily recommending the game. As it is, I would advise trying a copy first, if possible. A personal favorite. Really silly, with lots of laughs. Well, it's a funfair after all.